Indigo, is a colour of many faces and a story as old as time itself. Indigo traces its roots way back to the Indus Valley Civilization, which cradled the first cities of the world. Ever since, the colour has gone on to tell different tales as they happened through history.From the time it was discovered, it has led to many wars in its name. It has led to exploitation and rebellion in the same breath. The colour that once was so rare that only royal families were allowed to wear it, is now in danger of being overridden by chemicals. The age-old traditions of making the colour naturally is fading away thick and fast and with its process, even all of its poetry and culture is being lost. And in a country like India, where Indigo was at the centre of its culture, the colour in its natural form has been slowly disappearing. Yet, like in most tragedies, there has always been a sense of hope. And in this story, it has come from the unlikeliest of sources. Little pockets across the country have rejuvenated this practice, and have gone on a journey to discover the colour in its purest form. We at Untold trace the life of Indigo, as we try to unveil the mysteries of its making, and live through the journeys of its makers. Indigo is one of the most mysterious colours in the natural colour spectrum. May be the fact that it comes from the fact that it comes from the green leaves of Indigofera Tinctoria. This plant goes through an industrious process of oxidization and reduction to yield the colour blue. How mankind figured this secret of turning green into blue is unbelievable, especially when one is exposed to the process.Story of the living colour revealed itself when we enquired further into this claimed uniqueness.There are two parts to making Indigo. Part one is harvesting the plant and extracting the colour though a long process of oxidization and reduction. Indigo cakes thus made is then stored to be used through the year.Part two is making and sustaining the vat. This part is what makes it the only living colour. In olden times, Indigo that got used were the ones that would grow abundantly in the wild. It used to grow on its own in waste lands. During the rains, the entire family would go into the forests to harvest Indigo. The pink flowers bloomed in the rains and was an indication for harvest time, when the richest concentration of the colour could be obtained from the plant.They would bring it into the river bank and put it into a tank that was built on the rocky terrain. They would then press the leaves to the bottom with rocks and stones and pour river water into it. After leaving it overnight, the leaves and stones were taken out from the tank to obtain the residue liquid which would be slightly yellow.This liquid got beaten for 4-5 hours to ensure oxidisation and lime water added to this, again to be left overnight. Next day, black micro-crystals starts forming which looks similar to dirt in water and settles at the bottom of the tank. Water at the top is drained out and the Indigo paste collected at the bottom gathered in a cloth to be dried in the sun. This long process of making Indigo is nothing less than a craft by itself. The shade of Indigo thus procured could vary depending on time of the harvest, soil and climate in which it grows. Unfortunately, it is also a craft that is getting lost. A secret formula that is handed down from generations have almost become extinct. 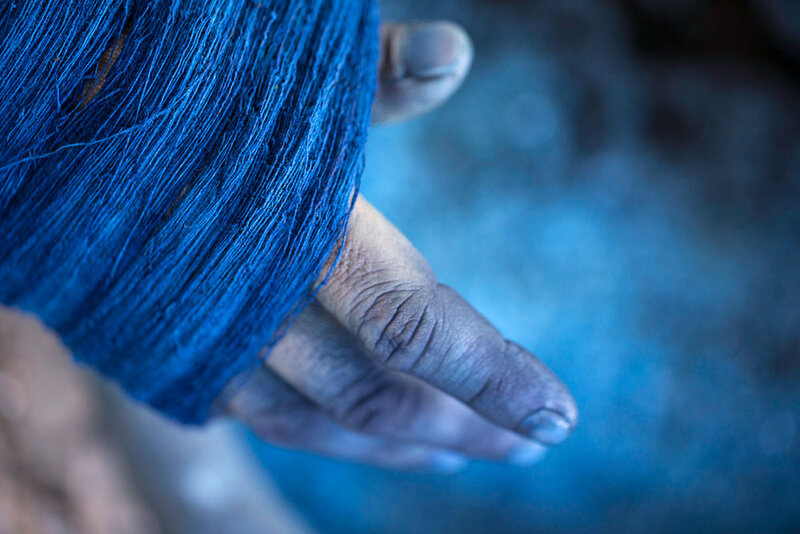 Most of the traditional dyers now depend on synthetic dyes that opens for them the possibility of mass production or they source natural Indigo cakes from other suppliers in the market. We traveled to the south of India and discovered a small district called Villupuram in Tamil Nadu where around 1000 acres of Indigo is cultivated and harvested. Many families of Planters have been cultivating it for generations right from the time of the British or even before. 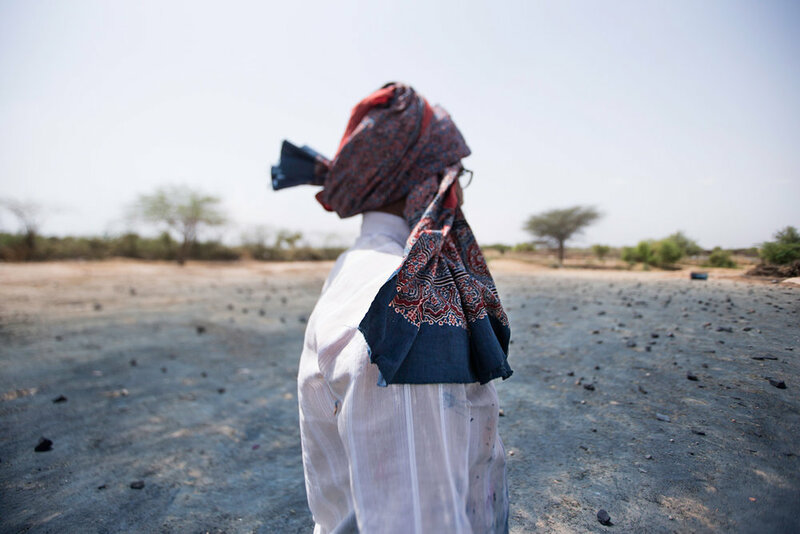 From the farms of Indigo, we headed to yet another arid belt of India that has been home to Indigo from time immemorial.The land of the white desert - Rann of Kutch. In Kutch, we stumbled upon Dinesh in Bhujodi, a weaver community hamlet. He is one of the patrona of Indigo, who defied the walls of tradition. From a reputed weaving family, he dared to move away from the tradition of weaving to explore and experiment with a new craft-the craft of Indigo making.In earlier times, the weavers would get their yarns dyed from the Khatri community themselves, bartering it with ghee or milk. But today, with the production requirement and their own demand for Indigo going up, time and effort that Khatris could afford towards yarn dyeing has come down. While blue was easier to attain with synthetic dyes, the market demand was rising for naturally dyed fabric. Weavers had to find their own way to get blue. Dinesh was still in college set up a pot (an earthen pot or the vat) in an attempt to attain Indigo. As instructed by the Khatris, he added lime and other ingredients. But despite many attempts, he was unsuccessful in making the Indigo blue. Soon after- wards, the Earthquake hit Bhuj in the year 2000 and broke his Indigo pot. He set up a new pot and continued with his experiments. Once he completed college, he finally decided to travel to Pondicherry in Tamil Nadu. 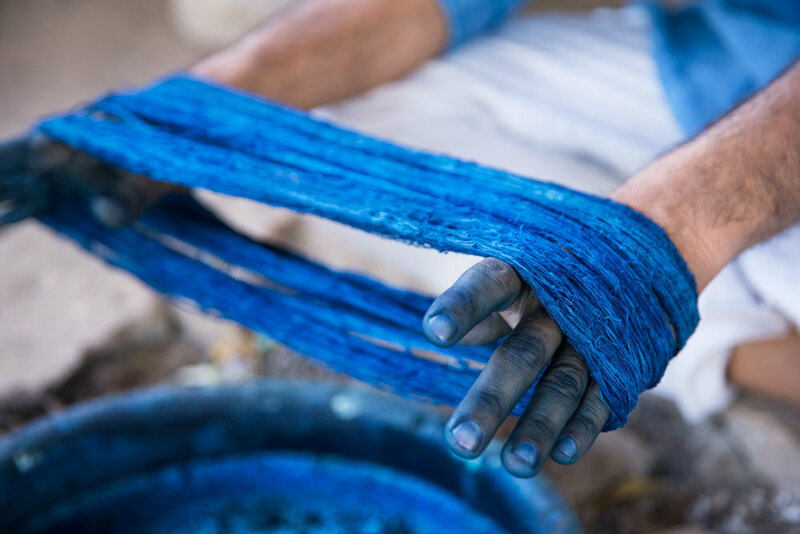 There, at The Colours of Nature, a small dyeing workshop in Auroville run by a Spanish dyer named Jesus, he finally picked up an understanding of the concept of Indigo and discovered why it was so difficult to get the colour right. Powered and enthused by this new found knowledge, he set up a vat pot again. But the struggle continued for a couple of years more without getting the colour right. He had reached a point, where the challenge had seeped into his being so much that there was no looking back or letting go. ‘If you fall in love with someone, will you let go? - Dinesh questioned us back when we asked him about his relentless efforts. Dyers vat is a very interesting place. It is 3- 4 ft. long pot, often dug and kept under- neath the ground. The key to maintaining a vat is temperature control. Indigo can survive in tropical climates needing almost 25 - 30 degree Celsius. The process starts when the pot is filled with water and the various Ingredients added - lime, dates, overnight soaked Indigo. These ingredients vary depending on the geography. For example, there are certain cultures which use pineapples instead of dates. This pot is then left for 15 -20 days, post which the indigo starts leaving its colour in the water to make it yellowish green. Till this happens, water remains to be blue. Once the fabric or yarn is dyed in this yellowish green water, it is kept for drying and slowly turns blue with exposure to oxygen. After one round of dyeing, the vat has to remain idle for a few hours for the indigo to become soluble again and to leave its colour in the water for dyeing. When we speak to the dyers, they often speak about Indigo as if it were a person. Not one, but all of them. We found it quite fascinating, the language they used around this colour. 'Making Indigo is like raising a child. You will have to feed it on time and take care of its every whim’ - Dinesh, the weaver from Bhujodi who took 13 years to work with the colour. — Dinesh, a man who took 13 years to begin to understand this mysterious colour. Then we followed the footsteps of the Khatri community to Ajrakhpur. Here in this village live the craftsmen who practice the age old craft of Ajrakh block printing and who can trace their roots all the way back to Sindh.The name ‘Ajrak’ also seems to have its roots in the Arabic word ‘Azrak’ meaning blue.The traditional color palette of crimson red, indigo blue, and white is said to represent the Universe: red for the earth, white for clouds, and blue for the sky and the universe. It is very likely that Sufism might have had a strong influence on the craft and its underlying philosophy, reflected in the passion they have for this craft. The idea of ‘Brahmand’ (the Sanskrit term for ‘universe’ and how the Ajrakh craftsmen refer to ‘universe’) also resonates with the Sufi philosophy. As the saying by Rumi goes, ‘The soul of the soul of Universe is love’. As the story goes, decades ago the river that supplied water to make Indigo, completely dried up.A Khatri family in the village of Dhamadka sent its sons and daughters ten different ways in search of a land suitable to turn green into a deep dark blue. The family then made 10 pairs of two and looked for lands to make a new home. 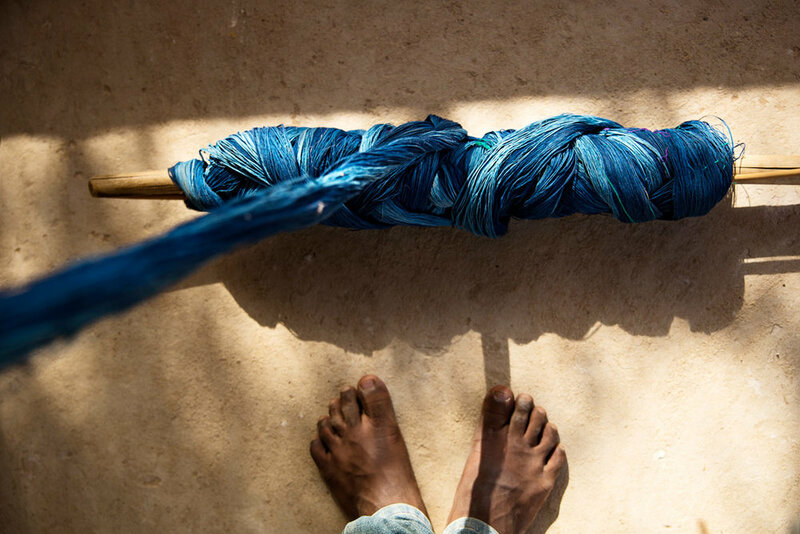 For hundreds of years, the Khatri family has not have mastered the art of making of Indigo. Yet they are still in search of this mysterious colour. The wax property in the colour is such that during winter the threads solidify and air doesn’t pass through because of which it gives warmth, while in summer, the wax loosens up and lets the air to pass through it freely, making it cool. Now this could have been of particular significance to people close to the white desert, which is prone to extreme climates in the course of a day- cold nights and hot days. If the phenomena were seasonal, one could wear clothing that goes with that particular season. But what would you do when there was a dramatic shift in temperature in a matter of say few hours. Ajrakh was that single piece which could be used to keep oneself warm as well as cool. No wonder then that it managed to capture the imagination of rich muslim Maldharis (nomadic tribal herdsmen) as well as local communities around the Ajrakh craftsmen. Along the journey of tracing the life of indigo through these different people who are struggling to keep indigo alive, we realised the colour is as elusive as its story.Also you don’t choose to work with Indigo, it chooses you.